This Friday night, I decided to taste the joys of High School Football and Florida High School football is serious business. Indeed as I have already indicated in the preceding one article, Florida is the No. 1 in terms of recruitment for the Pro Football. So there is a huge pool of talent and a great rivalry that goes well on a course of studies of heavy quality. Several options were available to me in the Tampa area with the big cars of the championship that are Plant, Armwood or Jefferson, but I finally opted for Lakewood High admittedly a little off center but because of the geographical distance from the center of the town has a community that is completely one with the football team. It is this passion that I do so choose Lakeland having exchanged opinions on various forums. The game seems so lopsided on paper, but to be honest I am interested in meeting it’s not really the sporting aspect, but rather how a community comes together behind his team and the atmosphere around the meeting . powerful and versatile runner. It acts as a blocker, receiver and bulldozer ball in hand. Is with the Halfback (HB), the running backs (RB).. Senior Taylor Placid but also in defense of its’ front seven, “the best in the state with some Jalen Stevenson a bright academic future. It is already dark when I joined the Bryant Stadium. I have to pay 5 USD to park my car at the rear of the stage and I prepare my equipment by providing a sweater for the cool seems to be back tonight. I have in my pocket valuable sesame Dan Talbot Athletic Director of Lakeland who kindly allowed my presence on the edge of key. I am very afraid of the quality of light as the first stage of youth is not (it dates from 1941). At first glance, it is acceptable.Finally when we used to shoot the Templars or the Hound in Paris, everything is acceptable The synthetic grass is new and billboards with screen video art and a variety of sponsors: not bad for a school. 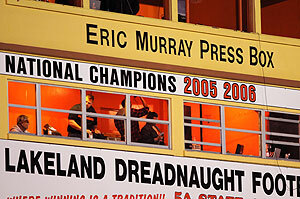 There is even a “Press Box” on which we recall with pride the two national titles gleaned from LHS in 2005 and 2006. Preparations are well underway in every corner of the enclosure and I am surprised to find that here as well a large orchestra that substantial team of cheerleaders and a dance squad for the less seasoned. It is almost like in College! The two platforms are already well stocked and Playoff requires the premises took place on one side and the other are the fans of St. Cloud who made the trip in droves. Note that to seem to work as expected because the first half is like a butcher. 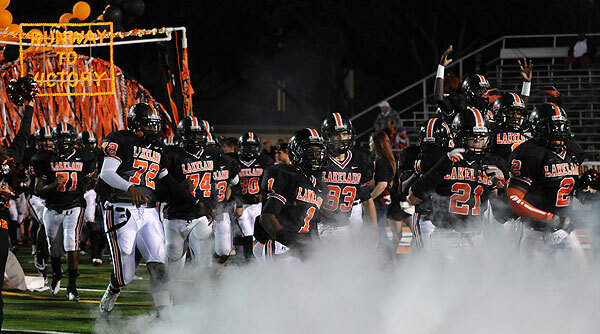 Team Lakeland held his game based on the conservative race and RB Orange and black piercing continuous defense of St. Cloud exceeded. The score is 13-0 at the end of first quarter time. Every TD in my eardrums take a big hit since the barrel and pulls a bell rang hollow sound throughout the stadium.In front of the Bulldogs QB tries what he can but it is too imprecise to find his receivers. At half time, Lakeland 19 leads to nothing and I feel that the game is bent. I take a look in the stands. Most people are dressed in orange-colored Lakeland. 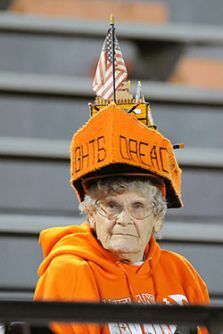 Some are irreducible as a hat mascot Lakeland is to say a massive warship. Lakeland off again on the same basis in the new score (26-0) and the Naughts will then commit two turnovers that will rank Dawgs to believe that everything is finally possible and instead of spending, the QB of St. Cloud decides now scrambler and tactics resisted because, after paying in the 3rd quarter time, St Cloud score two TD’s QB race to go back to 26-14. The flies have changed a donkey. You can feel the panic seize the Dreadnaught is a young team this season. The Bulldogs are galvanized. At the beginning of 4th St Cloud score again to go back to 26-21 and then they recover the ball well for a final drive to victory? No. 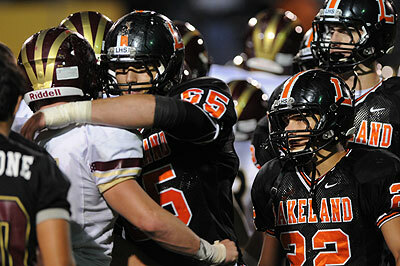 It is all this time too, the last attempt has failed and Lakeland narrowly escapes the corrections. Many players are in tears, St Cloud, certainly Seniors playing their last game here.